*** WINNERS *** Dan, Traci, Tracey and Dawn are Living the Life of Riley! CONGRATULATIONS! I want to give a big and hearty CONGRATULATIONS to Dan, the winner of the Arm & Hammer "Brush Your Teeth at Work" Toiletry Kit! Dan now has 48 hours to confirm! I also want to give a big and hearty CONGRATULATIONS to Traci, the winner of the Annmarie Gianni Normal Skin Care Travel Kit! Traci now has 48 hours to confirm! I also want to give a big and hearty CONGRATULATIONS to Tracey, the winner of the Nature's Sleep Closed-Toe Terry Memory Foam Slippers! Tracey now has 48 hours to confirm! I also want to give a big and hearty CONGRATULATIONS to Dawn, the winner of the PicturesonGold.com 2-Photo Sterling Silver Locket! Dawn now has 48 hours to confirm! One Response to *** WINNERS *** Dan, Traci, Tracey and Dawn are Living the Life of Riley! CONGRATULATIONS! 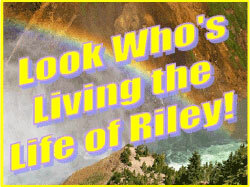 *** WINNERS *** Julie, Shirley, Yvonne, Rust and Happi are Living the Life of Riley! CONGRATULATIONS!